Bonuses paid by financial firms since the onslaught of the financial crisis will surpass £100 billion in 2015. Campaigners warn that Britain’s finance sector is continuing to breed inequality, while ordinary taxpayers clean up the mess. Financial justice campaigners say the figure equates to £1,500 for every man, woman, and child in the UK. Current research indicates that a small proportion of investment bankers earn more in twelve months that the vast majority of Britons do in a lifetime. In 2014 alone, Britain’s finance industry paid staff £15 billion in bonuses. Robin Hood Tax consists of a diverse collective of charities, trade unions, environmental groups, and politicians committed to tackling climate change and reducing poverty by taxing financial transactions. Hillman said financial regulation in the Square Mile is much too lax, allowing the finance sector to bolster its own profits, despite scandal after scandal. The financial justice activist said that soft touch regulation is not working in the UK, and reform of the state’s taxation policy is required. “Our softly-softly approach to the City clearly has not worked – it’s time we tackled this bloated sector by ensuring they pay more tax,” he said. High street banks throughout the UK are due to reveal their bonus pots for 2014. HSBC revealed their figures on Monday, while other banks are set to follow suit as the week progresses. Estimates suggest Barclays will reduce its total bonus pool from £2.4 billion to £2 billion. Bailed-out Royal Bank of Scotland (RBS) and Lloyds Banking Group will also likely announce leaner bonus pots. 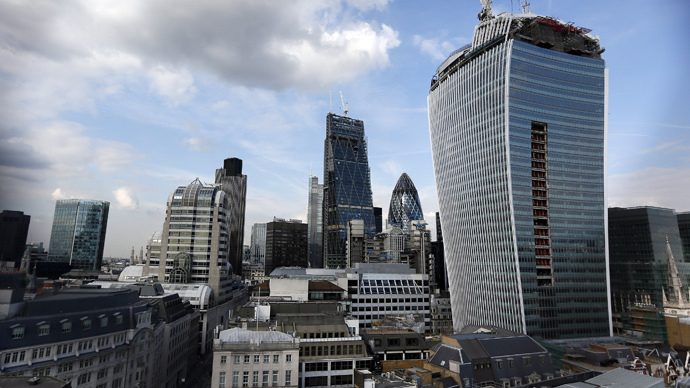 Britain’s financial sector accounts for roughly 10 percent of the UK’s economic productivity. It also accounts for more than 34 percent of all bonuses paid out by firms. While Brussels imposed a bonus cap across the EU at the beginning of 2014, banks have found ways of circumventing their obligations. Financial firms have sought to keep bankers’ salaries high by offering staff “fixed pay allowances” in shares or additional cash payments. Robin Hood Tax says that a small tax on the financial sector could generate £20 billion annually, prevent further public sector cuts, and furnish schools and hospitals. In January, ten eurozone states renewed a commitment to tax financial transactions following a series of meetings in Brussels. The British government has strongly opposed the tax, however, warning it could severely damage the City of London. The Financial Conduct Authority (FCA) is no longer able to retract bonuses in cases where financial misconduct has occurred. Speaking to the Treasury Select Committee earlier this month, FCA chief Martin Wheatley said its newly acquired ability to “claw back” rogue financiers’ fixed salaries could prove useful. However, whether the FCA will revoke reckless bankers’ salaries remains to be seen. In a lax regulatory climate, policymakers tend to back the interests of City financiers and big banks – to the detriment of UK taxpayers.